Drive right to the south end of the spit to drop-off your gear. Gear drop-off only (no parking) in the turnaround (at the south end of the spit). Return back up the spit to angle park. South-southwest through southwest and north (although not many sail them). Squamish can be an acquired taste. 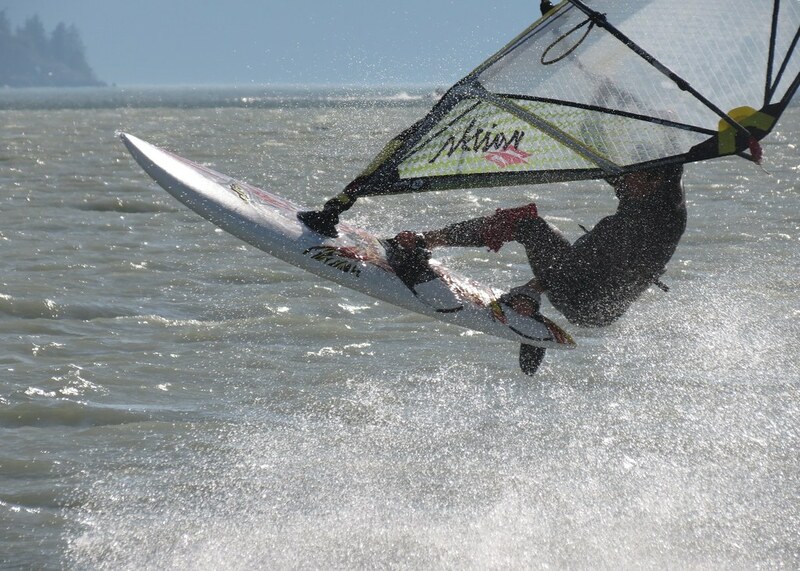 You may need a few sessions to become familiar with all it has to offer (launches, current, sandbars, voodoo chop, power zone/dutch oven at cliffs), but it can offer up fun flat water sailing. 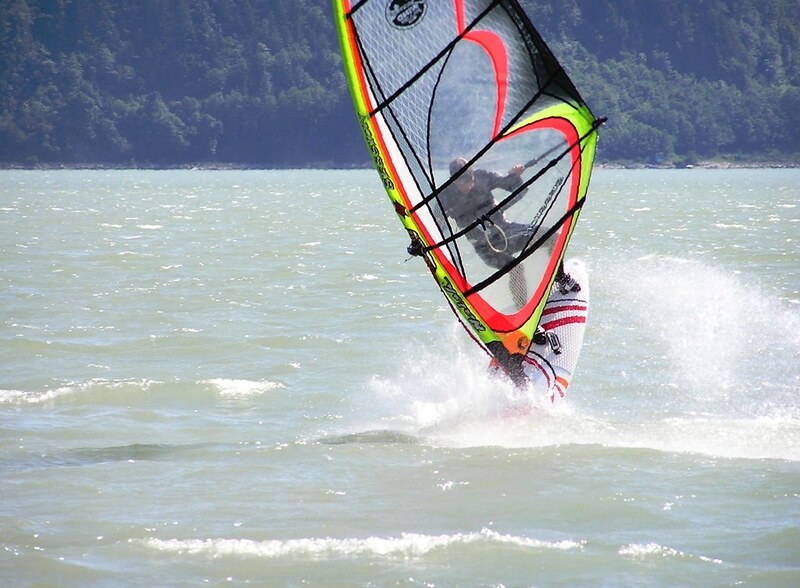 Sailing the river side is the preferred choice for windsurfing freestyle (especially on super flat water low tides), smaller gear and/or marginal conditions. The estuary is the preferred launch when it has filled in (easy to sail upwind) or you can walk out to the end of the pier to access the river on a low tide. The inner portion of the estuary is often called the ‘honey hole’ as the twin tip kiteboarders swarm to the flat water in the lee of Spit. Once out on the water there is a third area to sail – the open sound. 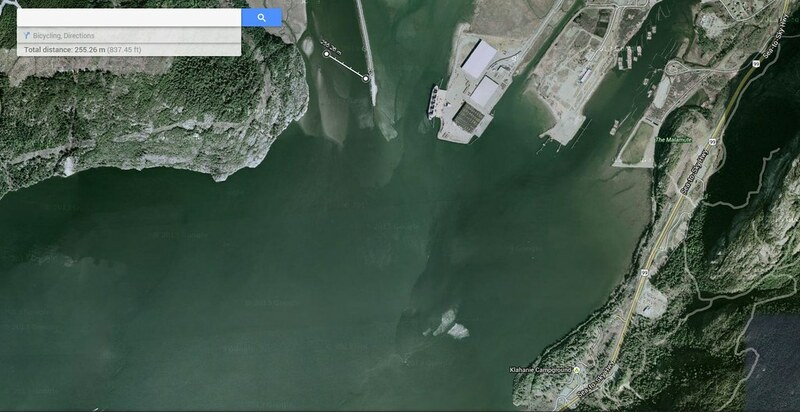 The river is about 250 m wide and Howe Sound is about 2 km wide at the end of the Spit. 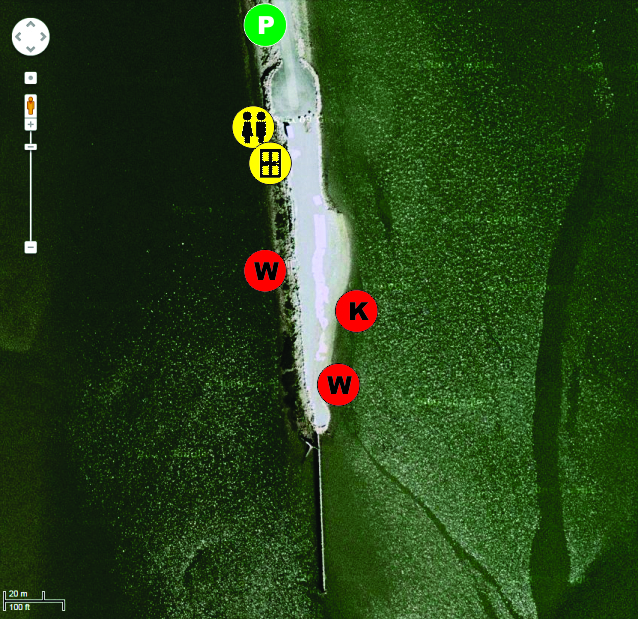 It is possible to sail at the Spit on any tide height, although a short walk (on a low tide) or short swim (on a high tide) might be required. The water depth is fairly consistent in the river and over the bank (with the exception of sandbar, stumps and other debris). Pea-gravel and rock on the estuary (Sound) side. Rock on the river side of the Spit. Sand on floor of the river, sandbar and bank (on the estuary side). Rigging mats at the south end of the spit. The rigging area can be crowded and the launch can be tricky at the Spit. Rig and launch at the end south end of the spit. Launching in the estuary is easier as there are no stairs or river current, but there can be a wind shadow caused by the wooden plies at the end of the Spit (especially when the tide is so high you have to swim off the beach). 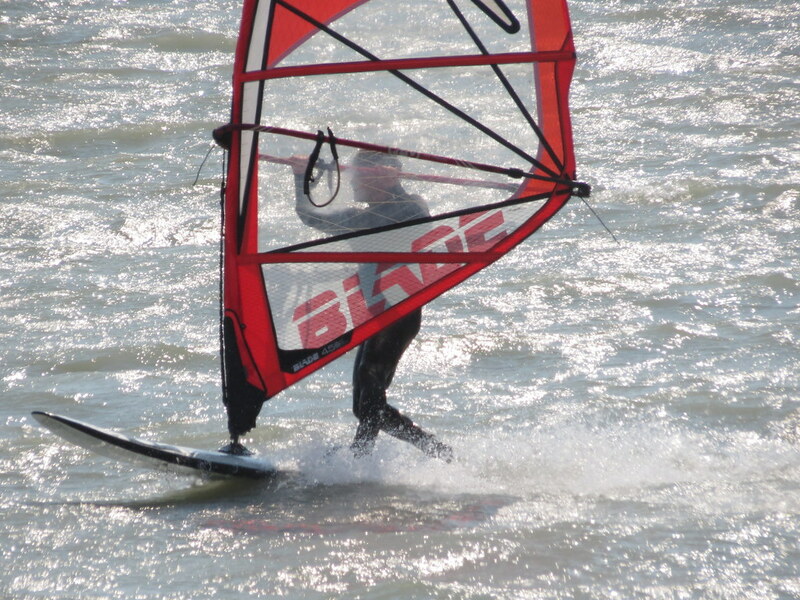 Windsurfers should stick to the estuary (sound) side your first time out. Don't launch into the river until you are sure you can do it. The river side launch offers clean wind and direct access to the river. The river launch is tricky - cold glacier-feed water, rocky shore, fast current, debris, etc. Think of the worst tide you have ever sailed in and then double that - that's what the river can be like. At low tide the river mouth narrows so the flow is faster. At high tide the river mouth is wider and flow backs off a little, but the first step into the river is deep! There is a ‘conveyor belt’ effect when sailing upstream into the river - you get a boost of a couple of knots of apparent wind, but the reverse is true once you jibe (less power in the sail and harder to point). If you want to sample what the river is like, sail into the mouth when the tide is about 2 m and you can stand on the sand bar - stay upwind (away from the spit). Point the nose of your board into the strong river current with mast parallel to current. Never, ever, ever let your clew drop into (against) the current when your board is pointing way from the steps (the river current and rocks have been know to shread rigs) - only downstream when returning to shore. For those who want a more space to rig and/or want to be able to stand on the bottom, Nexen maybe a better option. SWS operates the site including change rooms, porta potty, webcam, weather station, rigging mats, compressed air for kites and rescue service. 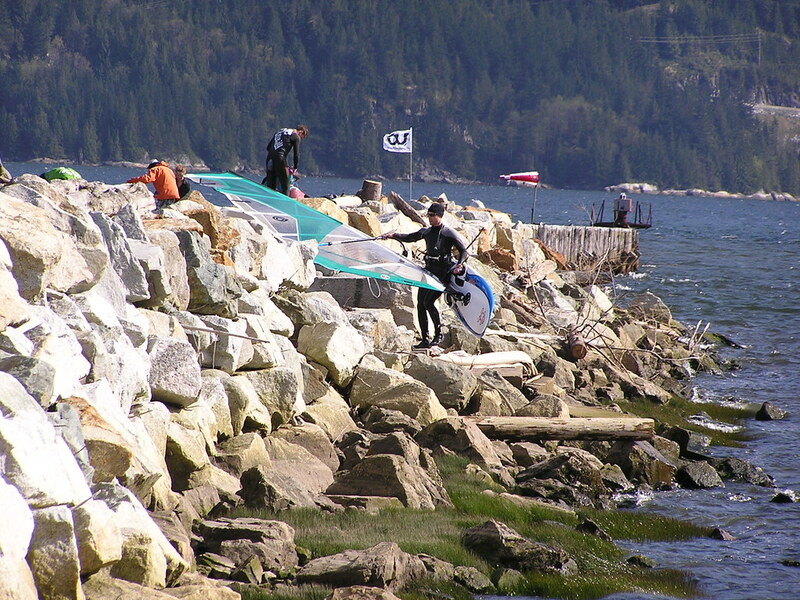 Launching fees (per person) by the Squamish Windsports Society (SWS) – daily rates and season passes are both offered. 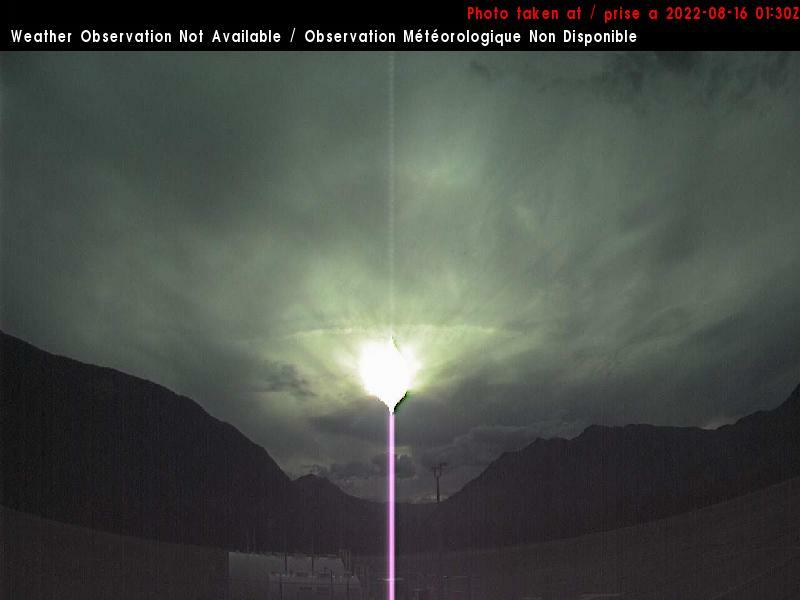 Predicting wind at Squamish is as much an art as it is a science as there are several contributing factors including pressure (infow or outflow), thermal (temperature gradient from Vancouver to Lillooet), and cloud cover. A string of hot weather days. Squamish will be weak or even starts outflowing during this time. Then, sudden cooling forecast for the coast. 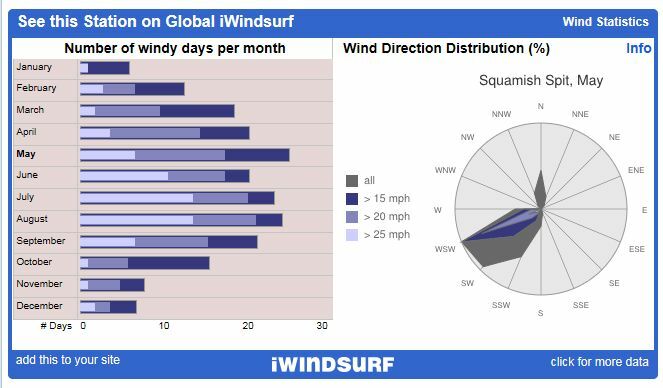 Windguru GFS forecast will predict 7+ knots of consistent southerly flow. 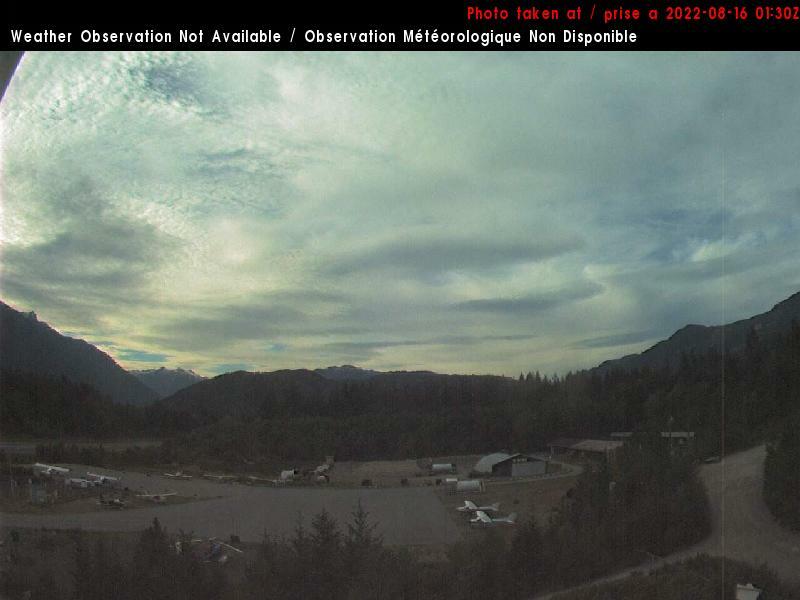 A morning marine layer of clouds may form over Vancouver is good. 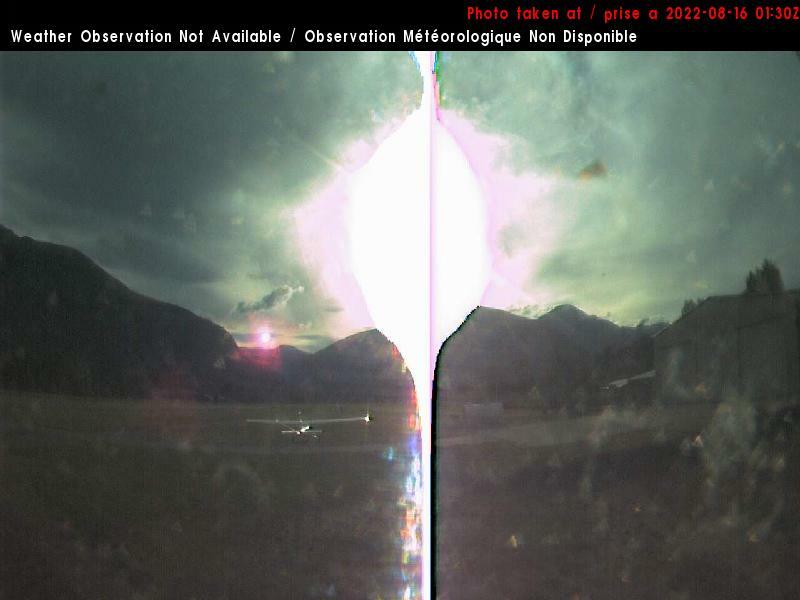 Squamish will start to inflow early around 8-9 am. 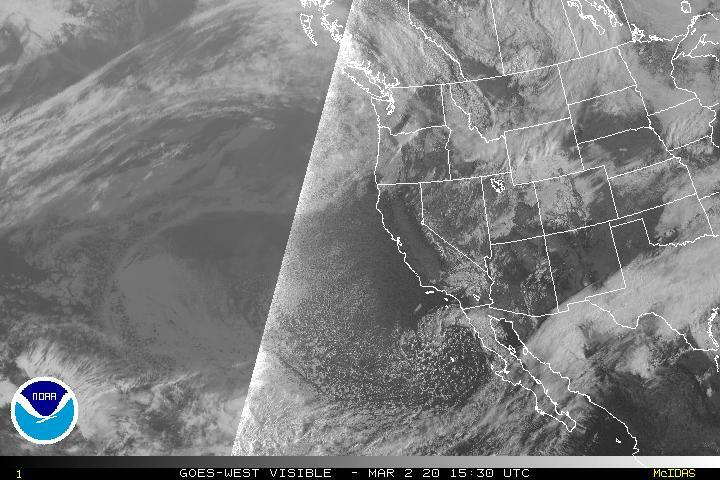 Centennial may also show light SW flow. Thanks to Alton, Elliot, Igor, PeterG, and Tony for sharing their local knowledge. 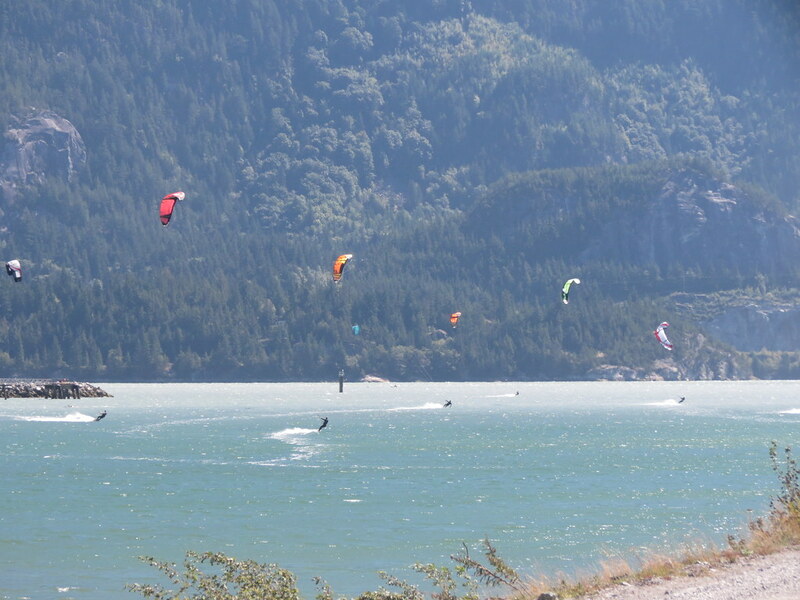 Thanks to the Squamish Windsports Society members, executive, and staff for operating this great site. 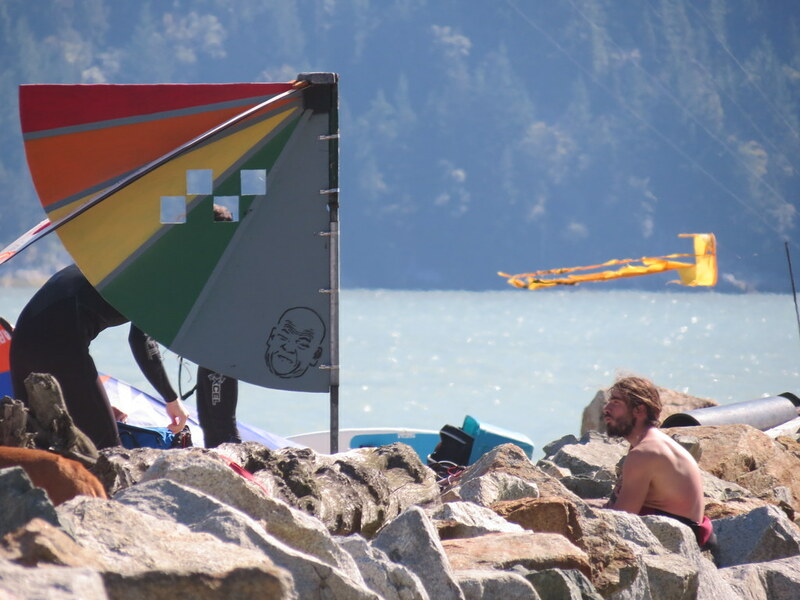 /edit (2015 Feb 28): Link to WindGURU, Squamish added to "Links" section. 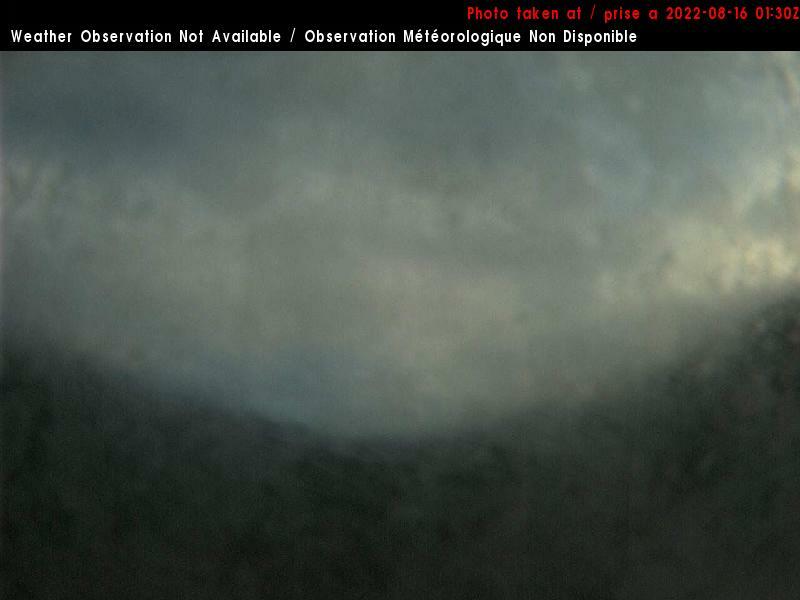 /edit (2015 Jun 4): Alton's webcam links added to "When to go?" section. Last edited by C36 on Sat Jun 09, 2018 9:26 pm, edited 16 times in total. Excellent write up as always, Dave. Thanks for taking the time. Is that Martin looping, btw?? AdrienGrelon wrote: ...Is that Martin looping, btw?? Yup. Guy has some skill! Slappy wrote: Anyone know the tide height of the river sandbar this year? It seems higher this year than in the past. On April 8th the tide was 1.8 > 1.2 > 1.4 m and the sand bar was exposed as shown here, but the bank (on the east side of the spit) remained covered with water. 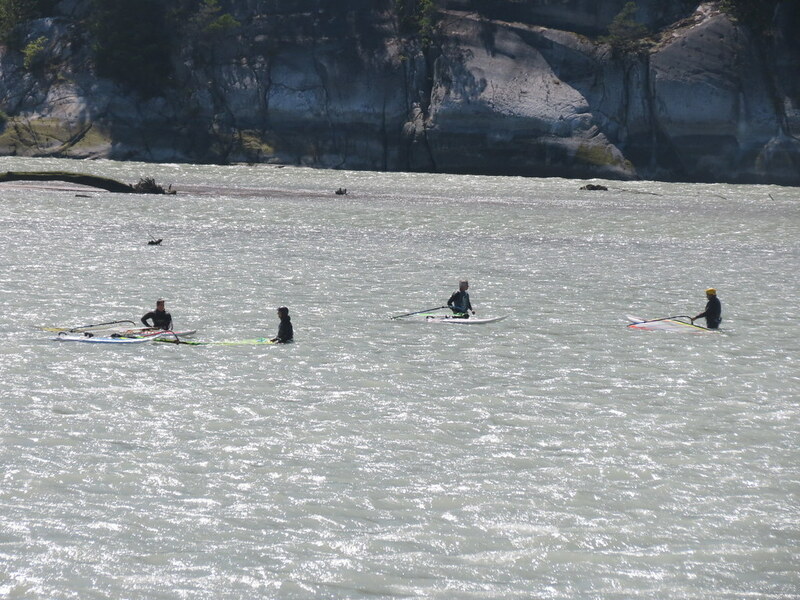 As you are suggesting the sand bar seems higher this year, likely a function of less water flowing down the Squamish River. 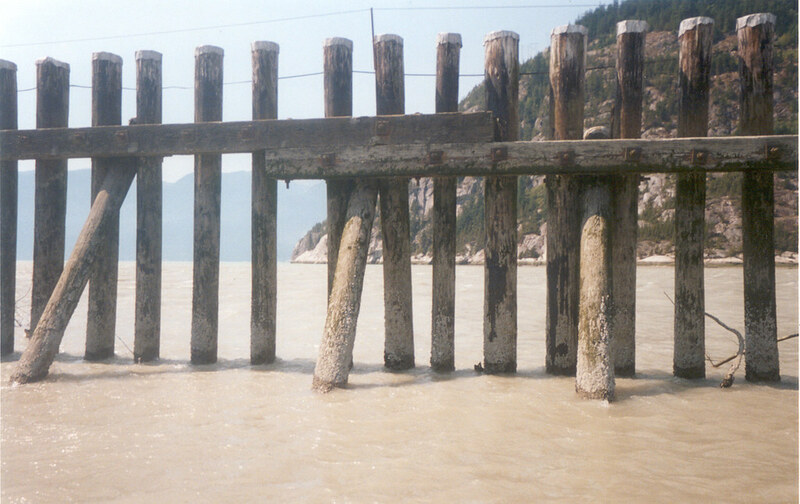 I had some old pics that I took of the bar while waiting for the wind that don't quite show the exact height but you can guess from them that it's about 2.0 m.
C36 wrote: the sand bar seems higher this year, likely a function of less water flowing down the Squamish River. Yeah, usually on a really low tide we get those walls of erosion on the river sandbar 1-2 feet high but this year I haven't noticed it at all.